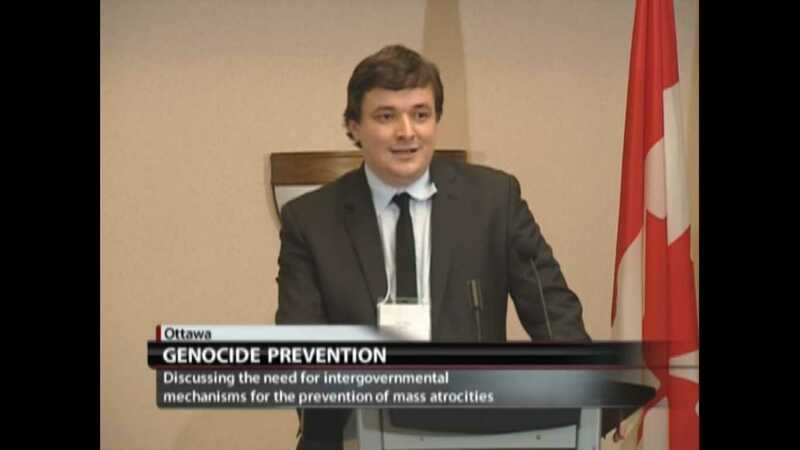 NEW YORK, April 3, 2013 – Amid the current stalemate over Security Council action to bring mass atrocities to an end, a recent forum in Canada focused on the potential for progress in national policy for genocide prevention. Galis noted “this trend of governments reorganizing and setting up new ways of working to promote” genocide and mass atrocity prevention, pointing to last year’s creation of the Atrocities Prevention Boardin the United States and the recently announced National Mechanism for Prevention of Genocide in Argentina. Joining Galis on the panel, which was broadcast live by Canada’s Cable Public Affairs Channel , were Canadian Senator Romeo Dallaire, Chair of the All-Party Parliamentary Group for the Prevention of Genocide and Other Crimes Against Humanity; Stephen Rapp, U.S. Ambassador-at-Large for War Crimes; and Ramiro Riera, Program Director of the Human Rights Department in Argentina’s Ministry of Defense. Thank you. Let me first of all thank Senator Dallaire and let me thank the Canadian International Council for inviting us to discuss this agenda on genocide prevention, and I will now switch to English, as I need to have my family around to speak French. We are here to talk to you about the challenges of operationalizing the genocide prevention agenda. I’m very grateful and very honored to have the chance to follow Senator Dallaire, to continue engaging you on this issue, and I will probably echo many of his words in the way I talk about what we at the Auschwitz Institute and what many of the states that we work with do in order to achieve the goal of preventing the mass atrocities and genocides of the future, or the potential mass atrocities and genocides of the future. The Auschwitz Institute was created in the belief that there is a necessity to honor the victims of the Holocaust by preventing their fate happening to any other persons, individuals, around the world in our day. That is why we have engaged on working together with states on building robust mass atrocity and genocide prevention policy, public policy, around the world. So what we are very concerned with, really, is making the transition from discourse to actual public policy. Our governments, unfortunately, have been very good at discourse related to mass atrocities now going back for several decades and centuries, but not too much public policy that specifically targeted this issue has been developed. We are very much inclined and dedicated to support any efforts that go in this direction. We also want through our work to make sure that what one of our colleagues at the U.S. State Department, Tori Holt, calls the magic wand hypothesis, that has been perpetuated in the past by civil society organizations or by certain actors, opinion formers, and which means that if only there was political will, everything would be solved within a few seconds related to mass atrocity and genocide prevention, just like a magic wand to make problems disappear was given to our governments, we are very keen on making that opinion disappear. And through our research and assistance offered to governments, we want to make sure that the hard work of developing policy day by day that follows this goal is actually the one that is appreciated by civil society and civil society partners with. So I’m going to tell you just two phrases about what the Auschwitz Institute is. We are a not-for-profit, an NGO, that was created in 2006 and that exists both in Poland, in Oswiecim, and in New York, in the United States, and we work mostly with governments. We complement the work of our brothers and sisters who are out in the streets, sometimes protesting and running advocacy efforts in legislatures for genocide prevention, by building the capacity of governments in all UN member states that would like to engage in this process. We do this in several ways, and we are happily supported by many UN member states and by the United Nations itself. Our first goal is capacity-building, and that usually starts through a very hands-on candid discussion in which we engage, a training discussion, in which we engage with representatives of governmental institutions on site in Auschwitz in Poland and where through the participation of experts from the entire world, from very diverse organizations, we are trying to build a basic common language, a basic common knowledge, about what does it mean, today, to prevent mass atrocities and genocide. That starts with really talking a bit about the history of mass atrocities and genocide, about the concept itself, about how we assess the risk of mass atrocity and genocide in our society or societies overseas, and what are the different policies that have been tried in the past, be they economic, military, diplomatic, or of any sort that have been tried and were successful, or failed, in certain situations. This is just of course the beginning and lays the fundament for engaging the institutions that participate in these projects, which are ministries of foreign affairs, ministries of justice, ministries of defense, human rights institutions, national human rights institutions, from the different UN member states, and the UN member states that participate in this process are very diverse. Usually, when talking to new audiences, everybody expects that this is one of those reaching-out-to-the-ones-in-trouble exercises. Well, it is not. Because all of us are in trouble, unfortunately. And it is reaching out both to countries that do exhibit risk of mass atrocities happening somewhere in the near future, but also reaching out to those states that have the capacity of engaging with situations internationally, and so we have participation both from what usually are called donor countries and from countries at risk. This diverse community actually lays the basis for creating a community of professionals that share a set, to a certain extent, of common values that we try to infuse, and a set of common concepts and public policy basic knowledge that we invite them to use returning to their institutions. In the past we have been developing bilateral relations with the institutions that have sent them and encouraged the development of different programs that, specifically there, advance the agenda; that range from educating the military before being deployed in a situation where there was a risk of mass atrocity in certain national contexts to truth commission technical assistance, in the setting up of very specific truth commissions. So here I’ve already gotten into the second part of our work, which is very much about technical assistance and increasing institutional capacity through that technical assistance. We have been very lucky, though, to see that after reaching out for several years on a bilateral basis, thanks to the initiative of several Latin American countries and our alumni from those countries, namely Argentina and Brazil, we have had the chance to assist them in creating the Latin American Network for Genocide Prevention, a very young organization that was formed almost a year ago in Buenos Aires, in which 18 states have committed to mainstream mass atrocity and genocide prevention in their public policy and to also increase capacity by implementing a common curriculum, core curriculum, that is collectively developed through three years. The very interesting part of this process is that it’s not just a long-term process but it’s also one in which the states commit to developing national policy mechanisms that are sometimes very targeted to a certain issue, or that sometimes genuinely reorganize the way the government works in terms of preventing, as a society, mass atrocity and genocide. And here I get to what we are really here to talk about tonight. It’s exactly this trend of governments reorganizing and setting up new ways of working to promote this objective. You probably have noticed in the news lately that this work has gained prominence in one of your neighbor countries, the United States — well, your neighbor country, the United States — involuntary humor is always the best! — through the creation of the Atrocities Prevention Board and through the creation, or projected creation, of national mechanisms for mass atrocity and genocide prevention in several Latin American countries. At the same time, national mechanisms that target this issue have been created in several Africa countries as a result of the work of the ICGLR. I’m coming also with a bit of good news to you, telling you that the Auschwitz Institute has just two weeks ago signed an agreement with the African Union Commission to to a certain extent push further the agenda of mass atrocity and genocide prevention on the African continent through the creation of the African Network for Genocide Prevention that targets both the way the AU Commission deals with this topic, but also the way AU member states run programs, institutionalize mass atrocity prevention, and change the way some of them work related to the problems that we are all exposed to through the news. This is, again, a very happy, welcome development and one that encourages us to try to go as deep as possible into studying and imparting knowledge about how this hard work, sometimes very ungrateful work, of changing the way civil servants work for preventing atrocities happens. And we have the honor of welcoming representatives from two of the states that have taken a very courageous path in this direction, and I will invite them to share with you some of their work in this sense. But please listen to these testimonials also with hearing my call for Canada to join this community. Canada has always been at the forefront of human rights work and has always been very much engaged in promoting in the world a recognition of the atrocities of the Holocaust. It is time that Canada joins this movement and that the government engages in redefining the way it addresses mass atrocities and genocide. So, keeping that in mind, please hear two of the existing models in this work and please do not hesitate to ask me any questions you might have about our work, because I’m sure I’ve forgotten lots of things that my colleagues will be unhappy about me forgetting. But now I would like to invite Dr. Ramiro Riera to share with you the experience in creating the Argentinian National Mechanism for Genocide Prevention. Thank you.